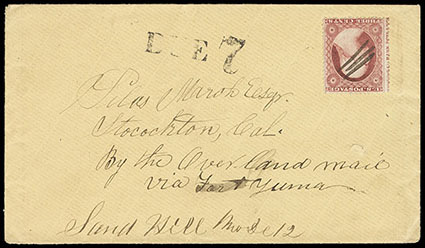 (Mail Routes) Butterfield Overland Mail, group of 9 covers comprising 1859 Saint Louis Mo. to Iowa Hill Cal. with/10¢ #35 endorsed "Overland Mail"; 1859 (Aug. 25) to Lt. in Sixth Reg. U.S. Infantry at Benicia Cal. endorsed "Overland via St. Louis Mo." with interesting letter; 1859 c. Pilot Point Tex. to Buchanan Mo. 3¢ Nesbitt entire; Salisbury Mo. to Fort Stanton N.M. Terr. with/3¢ #26 endorsed "Via Butterfield's Overland Mails", three unused preprinted envelopes with/unused 3¢ #26 to National Telegraph Office at St. Louis Mo., and 1861 correspondence pair, first with/#24, #26 strip of three from Savannah Mo. to San Joaquin Co. Cal. endorsed "Via Los Angeles" and #35 use not endorsed and sent via ocean mail route; some mixed condition, F.-V.F. (Mail Routes) Jackass Route, light buff cover with manuscript "Sand Hill, Mo, Dc 12" postmark and matching pen strokes cancelling 3¢ dull red (26) imprint capture at left, to Stockton, California, endorsed "By the Over-land mail via Fort Yuma" sender's endorsement, partial strike of "Due 7" handstamp to make up the 10¢ transcontinental rate; tiny internal tear, Very Fine and rare use. Carried on the Southern Overland Route (from San Antonio to San Diego on the "Jackass" route under the Birch contract if 1858, which is most likely given the reference to Fort Yuma, and from Saint Louis via Los Angeles to San Francisco on the "Oxbow" route under the Butterfield contract if 1860). 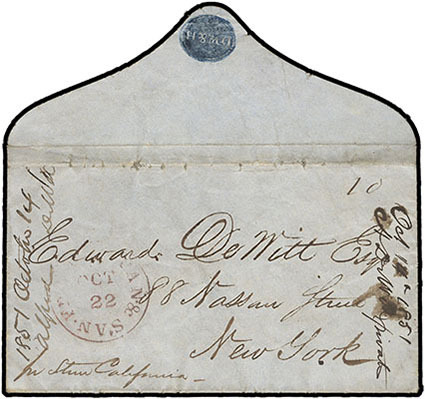 We offered a similar cover from the same correspondence in Sale 41 lot 454, realizing $1,150. (Mail Routes) Pan. & San. Fran. S.S., Oct 22, red cds and manuscript "10" cent due rating on 1851 gray cover to New York N.Y., endorsed "pr Stm California", 1851 docketing at left and right, F.-V.F., a very scarce route agent marking rarely struck in red, ex-DeVoss. 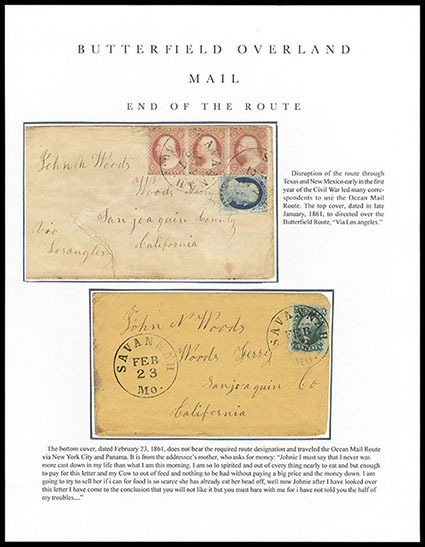 (Mail Routes) Santa Fe Trail, collection of covers, illustrations and related material to the Santa Fe trail, includes 1846 "Brigade Order No. 1" letter from Bela M. Hughes, Br. Gen. 1st Brigade 15th Div. Mo. Militia reading "The Regiment comprised in the bounds of Clinton County…the object of which is to guard this frontier from any attack from any quarter, war having already commenced with Mexico…", 1849 c. Philadelphia Pa. to Santa Fe N.M.; "Atchison K.T." use to Doniphan K.T., 1847 "Westport Mo." 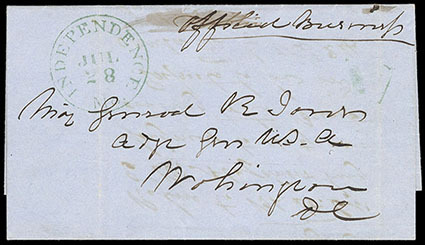 ms. postmark letter to J.W. Denver, "New Santa Fe Mo" ms. postmark use on 3¢ Nesbitt entire; "Council Grove K.T." cds on #26 cover (ex-Baughman); "Council Grove Kan." cds ms. "Paid 3" use to Greenville Ky. endorsed "Via Fort Riley"; 1860s Council Grove Kas. #65 use to Mich., F.-V.F. (Mail Routes) (Sante Fe Trail) "Albuquerque N.M., July 13th 1847", datelined folded letter from Capt. 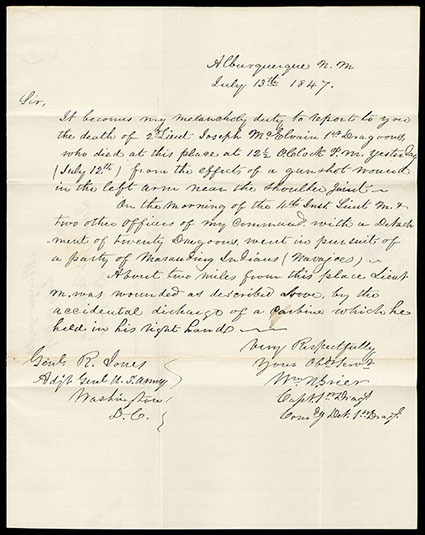 William N. Grier to Brig. Gen. R. Jones, Adj. 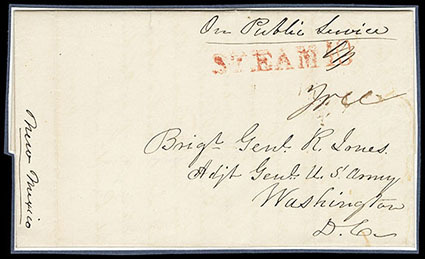 Gen. U.S. Army at Washington D.C., endorsed "On Public Service" and "New Mexico", carried by military courier back up the Sante Fe trail to Fort Leavenworth, delivered to a non-contract Missouri River steamboat leaving for St. Louis, struck with red St. Louis "STEAM 10" straightline rating due handstamp, "10" crossed out and manuscript "Free" rating since the Adjutant General had the franking privilege, receipt docketing of Sept. 24, 1847, two months 11 days after it was written, Very Fine and choice. A RARE SANTA FE N.M. MILITARY LETTER TO WASHINGTON D.C. This letter was written by Captain William N. Grier, a member of the Doniphan's Expedition that seized Santa Fe at the beginning of the Mexican War. Letter reads: "It becomes my melancholy duty to report to you the death of 2d. Lieut. Joseph McElvain 1st Dragoons, who died at this place at 12½ O'Clock P.M. yesterday (July 12th) from the effects of a gunshot would in the left arm near the shoulder joint. On the morning of the 14th Inst. Lieut. M. & two other officers of my command with a Detachment of twenty Dragoons went in pursuit of a party of Marauding Indians (Navajos). About two miles from this place Lieut. M. was wounded as described above by the accidental discharge of a carbine which he held in his right hand, Very Respectfully, Wm. Brier". 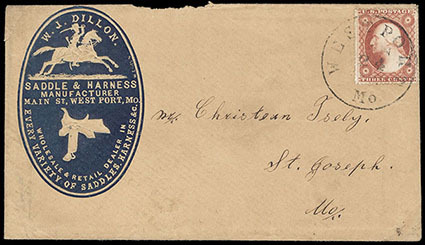 (Mail Routes) (Sante Fe Trail) Westport, Mo., Jan 24, cds ties 3¢ dull red (26) on buff cover with embossed blue "W.J. Dillon, Saddle & Harness Manufacturer" illustrated cameo showing Horseback Soldier with Lance to St. Joseph Mo. ; minor top edge paper loss, otherwise Very Fine and striking cameo advertising design. William J. Dillon, starting his saddle business about 1845, catered to the Sante Fe trail trade. It is believed that this town cds was the original instrument to which a year slug was later added.